Your service will be bordering on amazing with this Purity Order of Service card. The ceremony details—printed on the front—look très chic paired with pure white and a white-embossed border with inserts on the side. This look works well for both a contemporary and classic wedding style. Choose an ink colour for the front of the card to suit your wedding colours. Your hymns and readings will be printed in black ink. Aside from the personalised front cover/cover page, the rest of your wording will be printed in Times Europa as standard. 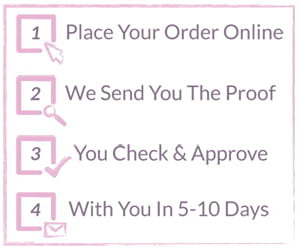 Please allow 48hours for us to set your proof, your order will not be printed until you tell us you are happy to proceed with the order. A standard insert (4 sides) is included within the standard price but additional inserts are chargeable. If this occurs a member of our customer service team will contact you to discuss these costs.